Support the Racine Theatre Guild for years to come through an endowment program or by adding RTG to your estate planning. 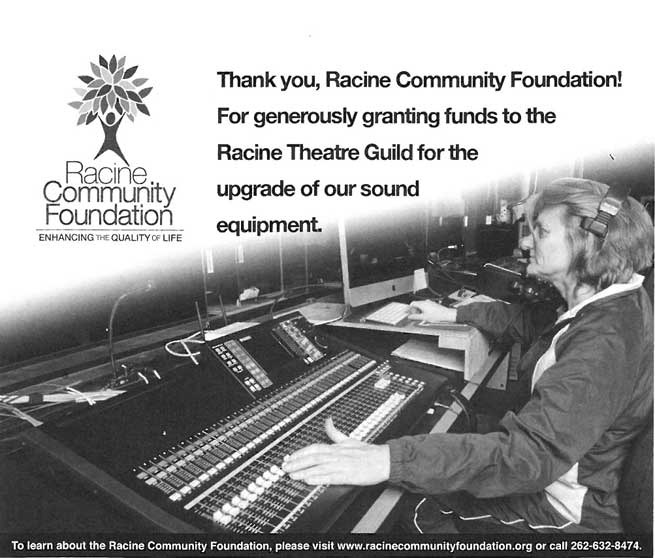 The Racine Theatre Guild has two endowments through the Racine Community Foundation. Find more information about creating your endowment by contacting the Racine Community Foundation at (262) 632-8474 or visiting their website: www.racinecommunityfoundation.org. Racine Community Foundation also donated to our Stairway to the Stage project in 2016. Bequests and other planned gifts have a profound and lasting effect on the artistic quality our patrons have come to expect from our productions and on the future of our theater. If you would like to join us in building that future, please consider naming Racine Theatre Guild as a beneficiary of your will or trust, IRA or other retirement plan, life insurance policy, land or property, life income, or other planned gift. To name RTG in your will, see your attorney or financial advisor regarding estate planning. Contact Joycelyn Fish with any questions at joycelyn@racinetheatre.org or (262) 633-1250.